(Camden, NJ) – The opioid epidemic has created a national public health crisis throughout the nation. One of the critical tools that first responders and front-line police officers are now carrying is called naloxone. This medication is an opioid antagonist and can in most instances make someone overdosing start breathing again by dislodging the opioid from the receptors in the brain. The effects of opioids like heroin, fentanyl and OxyContin have proven deadly in Camden County and the country. Currently, about 110 people a day are dying of an opioid overdose throughout the nation. Furthermore, out of the thousands of nonfatal overdoses that occurred in Camden County in 2017 more than 277 residents died of a fatal overdose. Freeholder Director Louis Cappelli talked about the importance of tearing down the obstacles to get access to this life saving antidote. The county’s four major health care providers have agreed to make bulk purchases of Naloxone and signed a Memorandum of Understanding with the Camden County Prosecutor’s Office to provide this pillar of harm reduction and lifesaving medication to our police officers. Hospital emergency departments have also been on the front lines of this battle administering naloxone on a regular basis as well working in tandem with law enforcement. Cappelli called this new initiative and partnership groundbreaking for local law enforcement. Joseph W. Devine, President of Jefferson Health, spoke of the impact the partnership can have on the community. Dr. Jim Baird of Jefferson Washington Township Hospital presented a physician’s perspective on the opioid crisis. 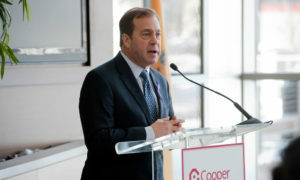 Eric Kupersmith, MD, said Senior Vice President and Chief Physician Executive at Cooper University Health Care, where the announcement was held, said no one is immune to addiction. Paul Sarnese, Assistant Vice President of Safety, Security and Emergency Management Virtua talked about the collaboration. Mark Nessel, Executive Vice President and Chief Operating Officer for Lourdes Health System commented on the healthcare partners’ commitment to the community. “Lourdes and its healthcare partners have a long history of working together to address the needs of our community. We are proud to be a part of this collaborative effort to facilitate the delivery of this life-saving medication,” Nessel said. Chief Christopher Winters of the Pine Hill Police Department provided prospective from the law enforcement community. “Although this program will have a positive financial impact for all law enforcement agencies in Camden County, the partnership of law enforcement and healthcare providers, working together with community stakeholders, will give communities the greatest opportunity to bring this health crisis to an end and appropriately respond to those affected,” Chief Winters said. The Freeholder Board and Camden County Addiction Awareness Task Force use numerous outreach opportunities throughout the year to increase awareness of prescription opiate and heroin abuse and addiction, and they assist in the creation of programs to help educate residents of the resources available to prevent and treat addiction. The Addiction Awareness Task Force distributes educational literature throughout the county, holds community vigils and educational awareness events, and worked with local law enforcement to expand access to medication drop boxes. In addition, the task force’s naloxone training program has equipped Camden County residents with overdose prevention kits, and provided every law enforcement agency in Camden County with naloxone. In February, the Freeholder Board filed a ground-breaking lawsuit against the drug companies, owners, manufacturers, distributors and retailers that ignited the opioid epidemic. The lawsuit was uniquely filed under racketeering statutes that deem these individuals owned and operated a criminal enterprise that marketed and shipped millions of highly addictive narcotics throughout the nation including Camden County.